Blackstones kept their cool to land the Under 14 Division Two title on Sunday. They had to win their last game at home to Park Farm Pumas Black to pip Peterborough Northern Star White to the honours and they made no mistake, cruising home 5-0. Alfie Webb and Lewis Jacobs both fired doubles with Adam Anderson completing the tally. Wisbech St Mary increased their advantage at the top of Under 14 Division One to five points with a 6-0 beating of Park Farm Pumas Blue. Steve Takam (2), Cai Taylor (2), Brody Warren and Willis Wright got their goals. Yaxley Blue Under 12s could have wrapped up the Division One title race with a win at Feeder Soccer on Sunday. 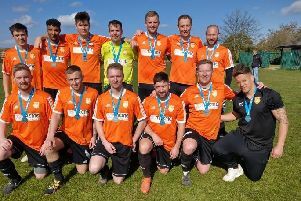 But they were surprisingly held to a 3-3 draw and now have to win their final fixture this weekend - this time at home to Feeder Soccer - to overhaul long-time leaders Deeping Blues. Louis Meadows, Matthew Mills and Louis Peters were the players on target for Feeder. Big game at Under 13 level on Sunday was the Hereward Cup final between Spalding Orange and JFC Boston. Division Three title fancies Spalding beat their Division Four opponents 4-0 with goals by Luis Cook (2), Jacub Zeri and Oliver Wilkinson. Under 13 Division One table-toppers Netherton Hawks finished their season on a high. They smashed Whitlesey Blue 8-0 in their last game thanks to Bob Horne (3), Drew Budd, Hashim Mohammed Hussain, Samuel Oakley, Habib Saifullah and an own goal. Hawks are, however, unlikely to hang on to top spot. Baston are just two points adrift yet still have four more games to play. Deeping Blue are three further points back with five games remaining. Holbeach clinched the Under 13 Division Two title in grand style. They beat Lincolnshire rivals Crowland 9-3 with Kye Bunce and Jack Greenacre claiming hat-tricks. Glinton & Northborough Black are the new Under 13 Division Four leaders. With JFC Boston on cup final duty, Glinton took the opportunity to rise to the summit with a 2-1 win at Hampton Royals courtesy of goals by Vinni Ball and Joshua Marshall.